London isn’t particularly known for its association with the space program – at least, not that we know of – but the Science Museum in South Kensington gives you the chance to get up close and personal with a piece of NASA’s history. 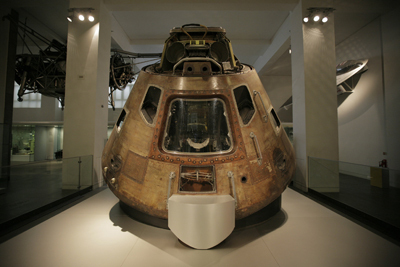 Located in the Making the Modern World gallery is the Apollo 10 command module, on long-term loan from the Smithsonian in the US. Launched in May, 1969, it carried three astronauts – Tom Stafford, John Young and Gene Cernan – around the moon in what was a dress rehearsal for the Apollo 11 moon landing which followed in July that year. Stafford and Cernan descended in the accompanying lunar module to within 14 kilometres of the moon’s surface before rejoining the command module. The command module had the call sign ‘Charlie Brown’ (named for the character created by Charles M Schulz) while the lunar module was ‘Snoopy’. The command module travelled some 500,000 miles during its eight day mission and reached a speed in excess of 24,790 mph on its return to earth, faster than any crewed vehicle since. The module splashed down in the Pacific Ocean on 26th May and the crew were recovered by the USS Princeton. WHERE: Science Museum, Exhibition Road, South Kensington (nearest Tube station South Kensington); WHEN: 10am to 6pm daily (7pm during school holidays); COST: free; WEBSITE: www.sciencemuseum.org.uk.